The Pitch Competition encourages students to explore and express their business ideas in a friendly and encouraging environment. The competition is open to all Washburn University undergraduate and graduate students and Washburn Institute of Technology students. You can compete alone or in teams of up to three people. $25,000 in cash prizes has been made available from Go Topeka to help students start a new business venture. Questions or want to join a team? Registration Deadline - Friday, November 2, 2018 by 5:00 p.m.
All current Washburn University and Washburn Institute of Technology students are eligible to participate, but you must pre-register to compete. You need to complete your registration form and bring it to the Washburn School of Business office in Henderson by November 2, 2018. Knockout Round - Thursday, November 8, 2018, Washburn Memorial Union, 1:00 - 3:00 p.m.
During the Knockout Round participants will have a maximum of three (3) minutes to verbally pitch ideas to a panel of judges (no technology use is allowed). The top five teams/individuals as decided by the judges will qualify for the Finals Round. Participants are asked to arrive between 12:00 - 12:45 p.m. to check in. At 12:50 p.m., there will be a briefing to out line the event in Washburn B. There will be four pitch presentation rooms held concurrently. Finals Round - Thursday, November 15, 2018, Bradbury Thompson Alumni Center, 6:00 - 8:30 p.m. Teams qualifying for this phase will be required to expand on their ideas and include more detail on their proposed venture in a maximum of six (6) minutes. Technology is allowed and a Powerpoint presentation expected. There will be five minutes for Q&A with judges. What goes into a pitch presentation? Students should develop and deliver an effective, professional presentation that includes a concise summary of a new business for a product, service or social venture. 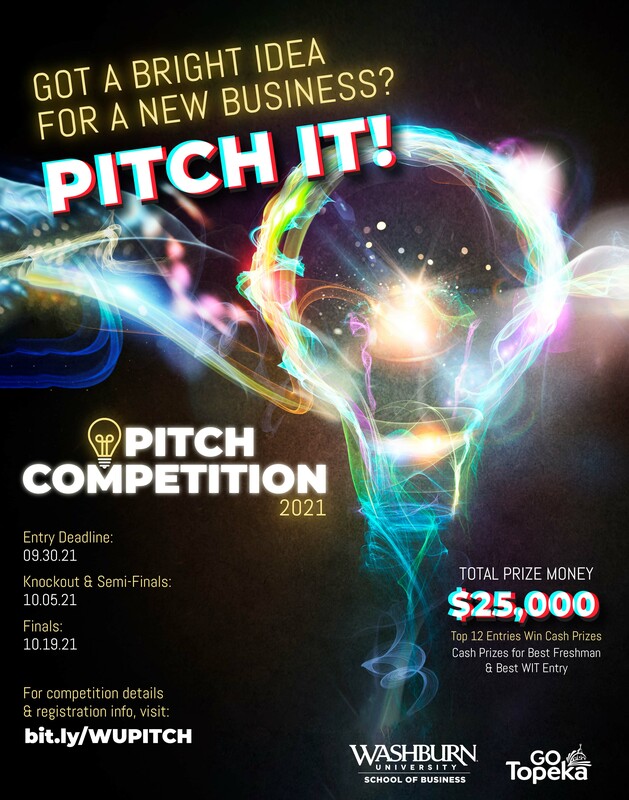 How will the pitches be judged? Innovation – Is this a new idea or how is it different? Business Model – How will the business operate and knowledge of the industry/market? Feasibility – Is it realistic to implement? Presentation – Was the delivery polished and impressive? Pitches are no more than three (3) minutes long. Judges are asked to ask questions only for clarification. Timekeepers will keep time and hold up a warning sign at the 2:00 and 2:45 mark. Visual aids are permitted, such as: poster boards, handouts, prototypes, etc. Presenters will NOT be allowed to use PowerPoint, computer or any technology for their pitch during the Knockout Round. All students/teams must arrive and check-in between 12:30-1pm. A listing of teams and the order of presentations will be available at check-in. Pitch presentations will run concurrently in four (4) different rooms. No microphones or audio equipment is available. Participants must be ready when their name is called to pitch. If not present when called, the moderator will ask for the next student/team to come forward. There will be a panel of three (3) judges for each pitch presentation in each room. After all pitches are completed, the results are calculated and the winners are announced based on total scores for each team, at the end of the event at approximately 3:00 p.m. Ties are settled by the judges. The top four (4) (the top entry from each room) will qualify for the Finals Round. The fifth qualifier will be the closet second place finisher to the winner in any room. Free food and drinks are provided. Other students and guests are welcome to watch.